Accessible Stadia Guide (ASG), the manual for clubs to cater for disabled supporters needs, is now 10 years old. 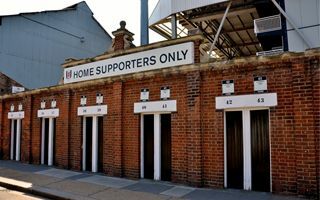 But despite numerous renovations or reconstructions of Premier League stadia over the decade, only 3 grounds fully comply with recommendations concerning disabled fans. In short, each new stadium of over 20,000 should accommodate no less than 150 supporters on wheelchairs and further 3 for each additional 1,000 regular seats. For stadiums over 40,000 the guideline is 210 + 2 per each additional 1,000. Of course disabled fans' facilities should be located in a way to facilitate access and provide decent sightlines. After a decade in force, not that much has improved. Anthony Joy, Arsenal fan attending games for 20 years in his wheelchair, gives a bitter testimonial. "Of course it's going to be an issue with older stadiums," he said. "I can kind of make allowances for that. But with the amount of money in the game, I think there should be some level of redress. "While there's a lot of money being spent on the corporate and hospitality side of the game, general standards of grounds are poor. That's not just for people in wheelchairs." The below list shows accordance of stadiums with the guidelines set out in the ASG. A stunning fact is that only three stadia meet the regulations fully, while others fail to comply, almost half of the league being below 50%. And while in general new stadiums are placed higher, some of those undergoing revamps after introduction of the Guide still fall well short of the goal, like Old Trafford. While most fans are willing to bear the conditions they face, it may be a really miserable experience to attend the world's richest and most expensive league if you're disabled. Anthony Joy recalls he saw almost nothing during the away game of Arsenal at Selhurst Park. Meanwhile at Liverpool, West Ham or Aston Villa away fans with disabilities are seated within home fans' sections. Liverpool say Anfield's age limits what they can do and insist they have carried out a number of feasibility studies into moving the wheelchair section for away fans. "Currently, it can't be done as travelling distance to the accessible toilets are outside the permitted maximum," read a statement. The club promised to address the issue during the upcoming expansion.